1. Choose Start > Computer > Organize > Folder And Search Options, and then click the View tab. 2. In the Advanced Settings section, deselect the Use Sharing Wizard (Recommended) option and click OK.
3. Navigate to \Program Files\Common Files\Adobe\. 4. 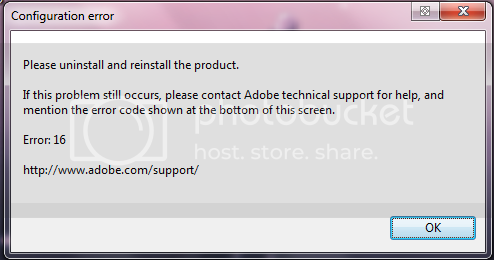 Right-click the Adobe PCD folder and choose Properties. 5. In the Attributes section, deselect Read-Only, click Apply, and then click OK.
2. If the User Account Control (UAC) elevation prompt appears, then follow the instructions to accept it. 8. In the Owner tab, click Edit and accept the UAC elevation prompt if it appears. 9. In the Change Owners Section, click Administrators. 10. Select the Replace Owner On Subcontainers and Objects option and then click Apply. 11. In the Permissions tab, click Edit and accept the UAC elevation prompt if it appears. 12. Select Replace Permission Entries On All Child Objects With Entries Shown Here That Apply To Child Objects. 13. Click OK and Yes until you have closed the FLEXnet Properties dialog box. 14. Launch your Adobe application.